With the opening of Cars Land at Disney California Adventure, new attractions will draw guests like ants to a gourmet picnic. 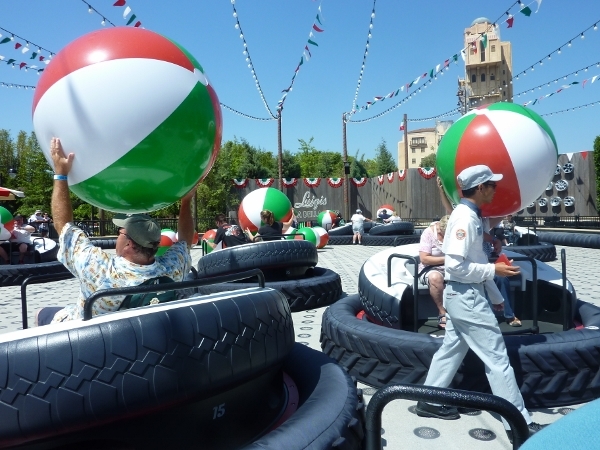 While Mater and Lightning get all the attention with their attractions, two of the film’s breakout comic geniuses have created their own smash hit – Luigi’s Flying Tires! Since fans of Disneyland have been crying out for years to bring back a ride like the historical Flying Saucers (which had a successful 5 year run in the early 1960′s), it is almost a no-brainer to realize that this will be one of the more popular attractions in Cars Land. I’d like to welcome you in and give you a tour of the attraction, as well as some tips to help you get the most out of your experience. Let’s go! While this attraction doesn’t need an explanation of the backstory to be enjoyed, it helps increase the appreciation of the overall experience. Luigi’s preferred line of tires, as proven by the first Cars movie, is the Fettuccine Tire company. While Fettuccine makes normal radial tires, Luigi has a great love for their whitewall variety, the Alfredo. He displays the whitewalls with great care in the showroom and out in the garden. Disney Imagineers tell us that his Uncle Topolino ordered some of the Cuscino D’Aria tires in the 1930′s and they floated upon arrival. Overjoyed at the miracle, a festival was held, with music, dance, and plenty of Italian spirit! Upon coming to America, he shared it with the residents of Radiator Springs. Luigi then ordered the Cuscino D’Aria tires, like his uncle before him. When they arrived, they danced just as they did for Luigi’s uncle! 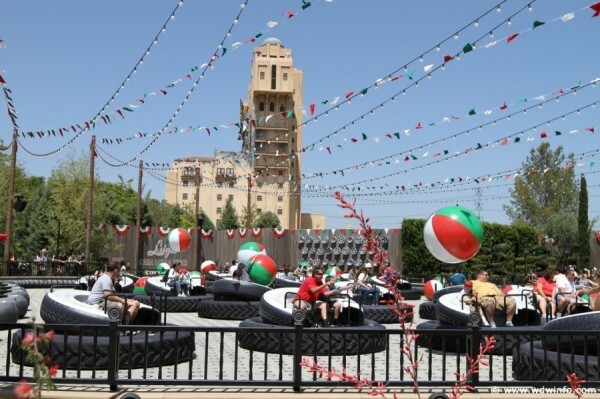 Now, Radiator Springs repeats the Festival every year, complete with festive decor and balloons! 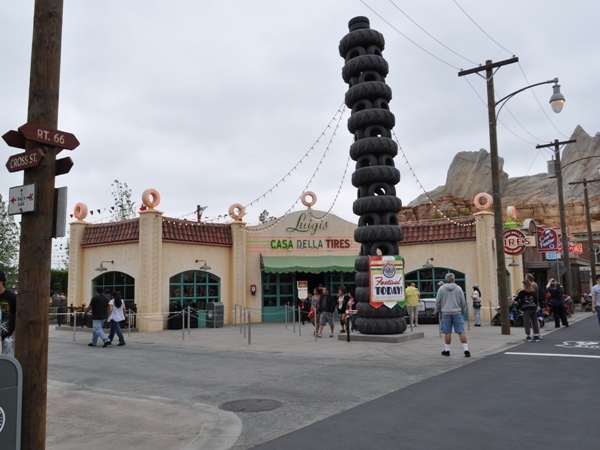 The entrance of the attraction is, of course, Luigi’s Casa Della Tires. as well as critical boarding training! 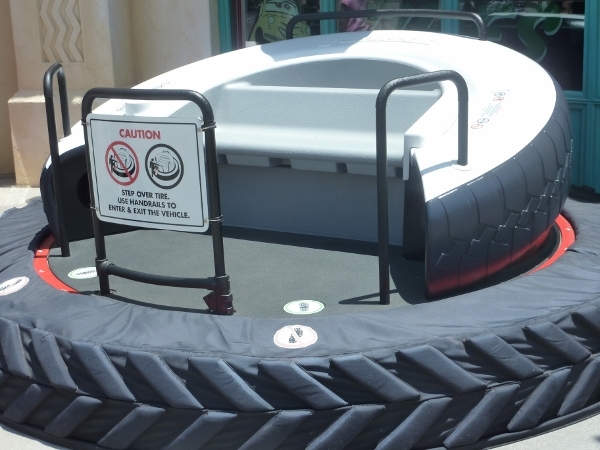 I thought this was a novel way to introduce new riders to the system, in order to reduce damage and ensure that the tires are functioning for guests as much as possible. When you enter the queue for Luigi’s Flying Tires, there are a few things you need to know. Minimum height for this attraction is 32 inches. The length of this queue is extremely deceptive. The approximate wait time from the entry door of Casa Della Tires is about 60 minutes. Yep. The interior queues are that big… When you add to that the overflow queue area (where they can add and remove ropes and posts as needed), you have the potential for 90 – 120 minutes to wait. There are no drinking fountains in the queue. The first queue exit (for potty emergencies or rejoining your party) is just outside the back of the Casa Della Tires building, where it joins the garden. Disney is testing a new guest satisfaction technique – snack vendors wandering through the queue. Besides being a “genius technique” from a merchandising standpoint, this gives the captive guest a chance to get that snack to keep them occupied. 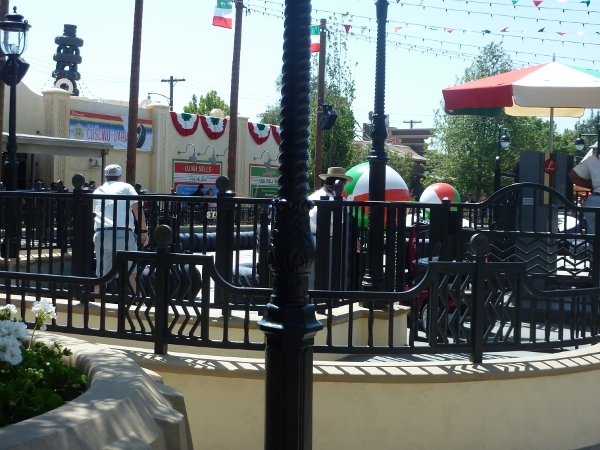 Dressed as 1930′s deliverymen (think milkmen all dressed in white uniforms), these popcorn, ice cream, and drink vendors add a nice touch of era theming! The queue takes you through the tire showroom, the changing room and museum, and passes by Luigi’s office before taking you out to the garden. You might think the line ends there, but the garden portion of the queue has 3 segments! As you enter Luigi’s Showroom, your immersion into the movie begins. It really does feel like you are stepping in to see the selection, especially the famed Fettucinne Alfredo display! Other than that, the showroom and changing area have some fun decor in all of the posters and memorabilia that Luigi has collected. See how many references to the movie characters (from Cars 2) that you can find! When you come out into the garden from the queue, you get your first real glimpse of the Flying Tires. After the initial impression that this queue is godforsakenly longer than you thought it was, you realize that it has to be one of the most vibrant and colorful attraction scenes that Disney Imagineers have come up with in a long time. Several different varieties of red and white flowers, ornamental shrubs, and mediteranean cypress and eucalyptus trees decorate the queue and highlight the theming. 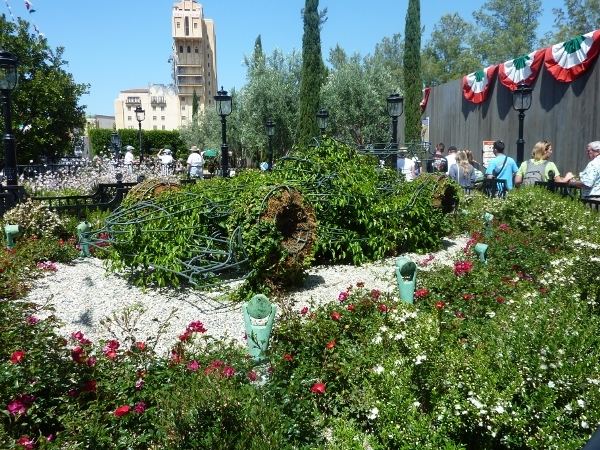 One of the centerpieces of the garden will only get better as the attraction gets older – the Francesco race car topiary! For a garden enthusiast like me, the flowers, the red, white, and green accents, and the sounds of laughter coming from the flying guests, really make this area come alive! These huge white-walled marvels can really sail for folks that get the hang of them – and grasping that technique quickly is of utmost concern to those who have been waiting in a long line to fly them for 3 minutes or so. That was also a concern of the folk designing the queue. 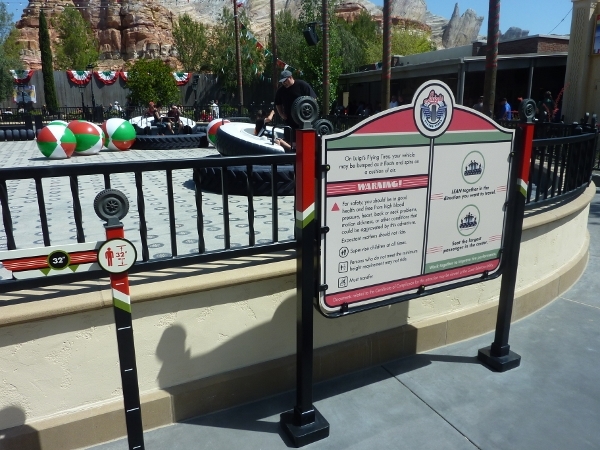 The wall has decorative posters to instruct guests before they reach the final loading zone, as well as a training circle. Let me explain. 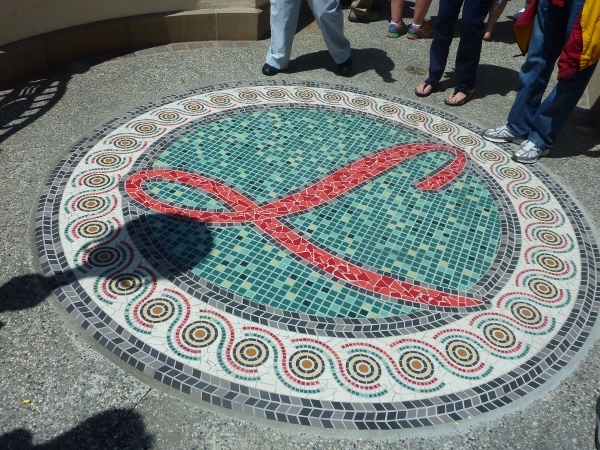 As you get closer, you transition from the standard line portion of the Garden queue to a small circular courtyard with Luigi’s Family Crest, reminiscent of a mosaic tire laid into the walkway. 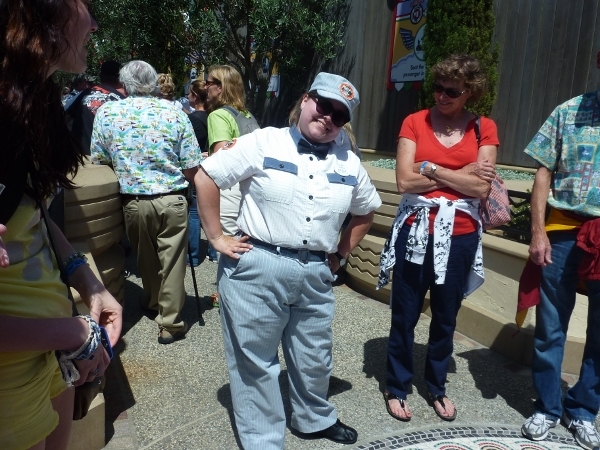 Here, cast members ask multiple families to stand around the circle so they can speak with us. Here, we were given our first lesson in flying. According to tradition, the key to flying your tire comes from the ability to work together. You have to lean the same direction at the same time in order to maximize movement. It takes a little more than that, but I’ll talk more about things in the “Flying Tricks” section. 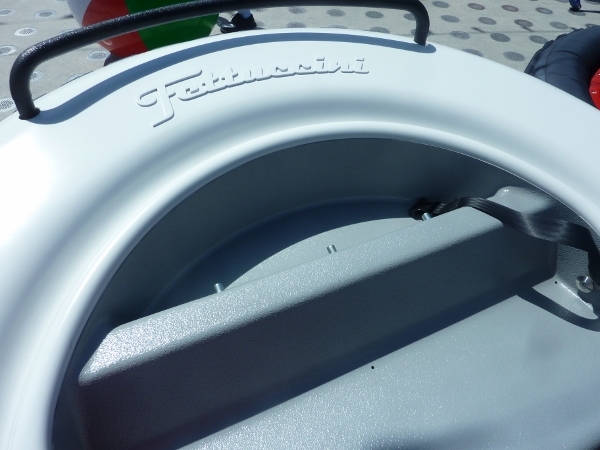 Each tire accommodates up to 3 guests: 1 child & 2 adults, 2 children & 1 adult, or just 1 or 2 adults. Prepare your child’s expectations. 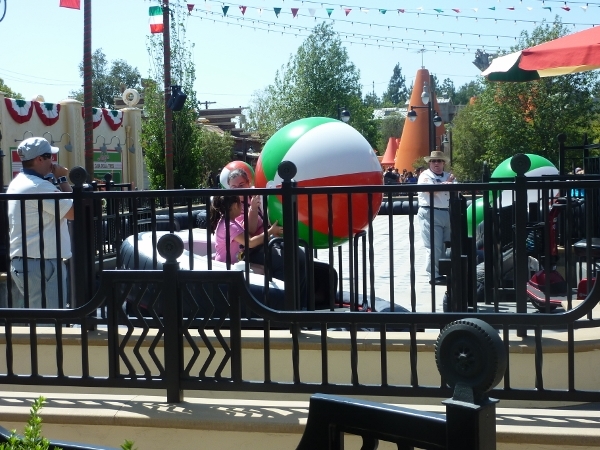 If your child is like mine, and wants to sit by herself on every ride she can, it really isn’t feasible on this one – smaller kids don’t weigh enough to move the ride vehicle on their own. After your flight training, you move into the final part of the queue – the loading corral. You are given a “Flag” that will be collected by cast members as they check your seatbelts. They use this system on Dumbo with crow feathers and it makes sure that they have checked every tire on the floor, no matter how chaotically they are scattered. The one fun thing is that the holding corral is that it is divided up into 4 gate lines, each named after a different style of Italian coffee! I could be wrong, but I think these might just be a display of whitewall styles of the Cuscino D’Aria tires! One of the most subtle “advertisements” that the design team has ever come up with!!! Off to the left of this boarding pen is the wheelchair boarding zone. Cast members pull one of the tires into its own corral in order to load the guest at their own pace. When the guest is ready, the gate is opened and the guest is on their way. When you’re given the release signal, you enter onto the festival dance floor and board your tire. You are not assigned a specific tire and can choose whatever one you can get to first. 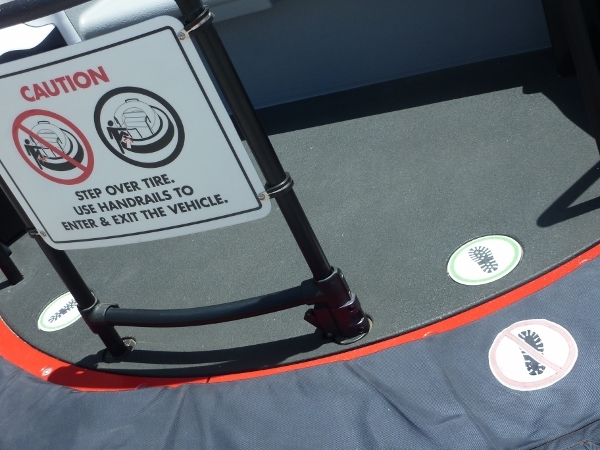 Make sure you step over the tire portion and into the specially designed seat! There is a storage platform behind the seat for your loose items. Now, as you saw in the photos above, there is one added challenge to flying your tire across the dance floor – the “balloons”! 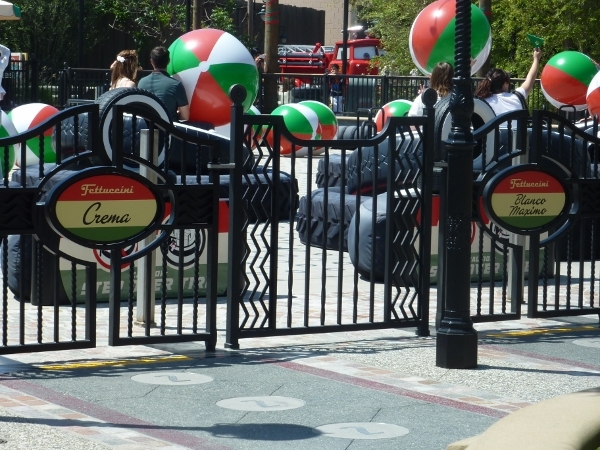 These huge beach balls are distributed to guests by the cast members as they go from tire to tire, collecting your flags. 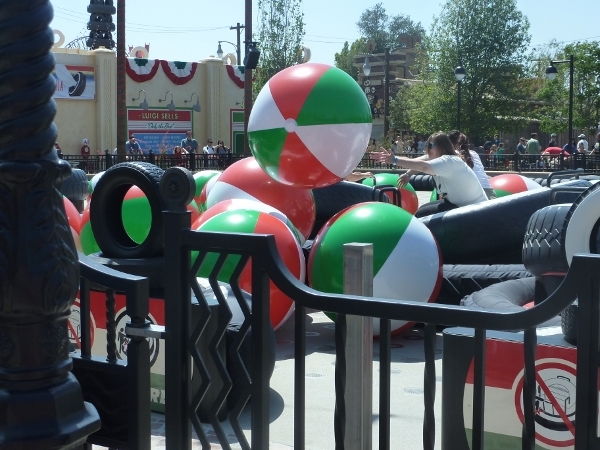 I think half the fun of the attraction is in playing with these massive beach balls. If they were any smaller, I think the effect and the play of the game wouldn’t be the same. When the dance starts, the object is to toss these balls at other tires while gliding around. There is a surprise, however. The tires don’t float on the surface of the dance floor like your tires do! This adds an extra challenge if you want to pick up another ball. It definitely takes some skill! We identified a few tips to make your flight a bit more enjoyable. It’s important to identify the weight center of your tire right off the bat. If you have a small child with you, you might have to shift yourself a little more to the left or right to make the tire move to compensate for their size. Your weight distribution also determines how far you need to bend forward or backwards to go in those directions. Forward is harder than backward. Coordinate with your other riders on which direction to move. We saw many tires where one pilot was leaning to the left to steer, while the other decided to lean right to reach for beach balls. These folks barely moved at all during the ride. The best way to get small children to lean with you in the same direction is simply to put your arm around them before attempting to move. Not only does this shift their weight with yours, it makes them feel secure and adds to the enjoyment that you both are having a great time together! That hugging thing works for helping adults move together, too. It’s a good way to test the waters on that first date, as well as on that 25th anniversary! 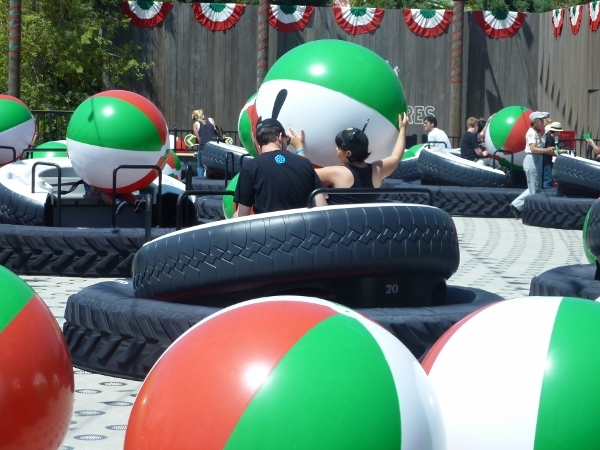 Since the beach balls don’t float and aren’t large enough to simply grab off the dance floor, the best strategy to pick one up is to squeeze one between your tire and something else. This could be the wall or another tire. You decide which is more fun! When the ball is squeezed, it will pop upwards for catching. If you tap it, instead of squeezing it, you’ll just push it farther away from you. If you see a cluster of beach balls off to one side, you can pretty much assume that everyone else did too and they will be making a beeline for them. Don’t get caught in the mad rush. 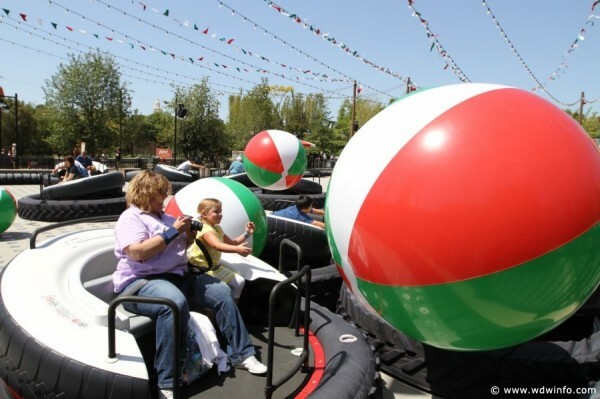 If you just want to pilot and not play with the beach balls, try to move yourself away from that action. It’s not hard. Simply try to board a tire that is furthest away from the loading zone and off on its own. For those wearing skirts and dresses into the park – be aware! When you enter and exit the dance floor, you may inadvertently be reenacting Marilyn Monroe’s famous dress scene from The Seven Year Itch! Remember, Cars Land is a G-rated park! I’m sure there are a few tips I’ve forgotten. If you have any others, please share them with us in the comments. I know we would all love to see them! Oh. Before I forget…. Make sure to look around you when you are piloting your tire and again when you exit the attraction. Take note of all the smiles and laughter. I think that sight is the icing on this Italian Festival’s cake! Photos by N. Johnson and C. Martin.